In the world of boxing, a "cut man" is someone who stops the blood flow so that the match can continue. For twenty years, F.X. Toole worked around the world as a boxing trainer and a cut man. His experiences in the ring led to Rope Burns: Stories from the Corner, a stunning collection of short stories about the world of boxing and its inhabitants. Born in Long Beach, California, Toole's personal saga was no less extraordinary than those of his protagonists. The Irish-American theater major studied acting while stationed at Brooklyn's Fort Bennett Field during the Korean War. Later, he studied Spanish in Mexico City under the G.I. Bill and worked as a bullfighter. Toole has earned a living in a variety of pursuits: unloading banana boats, driving cabs and owning his own saloon. After a long career in boxing that took him around the world, Toole published Rope Burns, his very first novel, at the age of seventy. 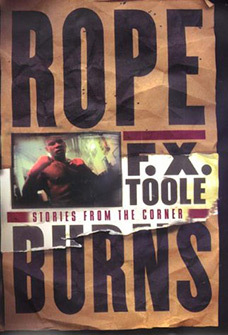 In Rope Burns, Toole explores the world of boxing with an insider's directness and understanding, all the while remaining true to the flawed, noble humanity of his characters. Their stories are told with affection and candor, in a book that Joyce Carol Oates calls "a complete and generous version of a world that most of us can never approach, still less enter. These stories are funny, disturbing, unpredictable, and suspenseful, but most of all they are achingly real..."